KDRAMA MONTHLY TOP TEN by DRAMAFEED | Copy & Paste Guidelines – Always put a link back to the source. Monthly top ten lists? Looks like AGB Nielsen decided to sort through the data and make it for us. Here’s the top ten list of programs for the month of January by viewership ratings. Note that I added in the English title of each title. 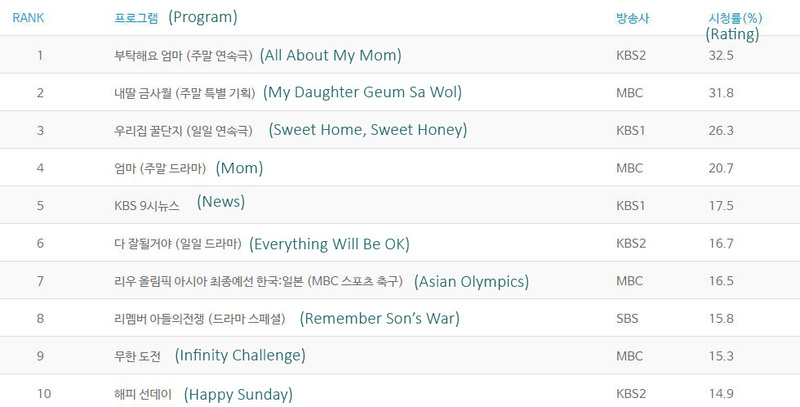 Particularly relevant for DRAMAFEED viewers would be that Sweet Home, Sweet Honey (I’m still recapping this – though, I’m behind) ranked third over all right below the weekend dramas of All About My Mom and My Daughter Geum Sa Wol. So, how do we match up with the viewership in Korea? Look below for a nifty chart to see what’s going on. Unfortunately, Everything Will Be OK has not climbed on to the weekly ratings. (Don’t worry OK fans, as it does hover around Rank 6 in the daily rankings!) But, Our Home, Honey Pot came into the drama world with fists up! Ranking 3 in the week against shows that have been around for at least two months! Is it worth the hype? You decide!